The NSW Agency for Clinical Innovation ( ACI ) is a leader in the design and implementation of innovation in healthcare. The ACI established the Clinical Innovation Program in 2014 to discover, develop and provide support for the successful implementation of clinical innovation. The Clinical Innovation Program has two streams: Acceleration of an ACI project and Spread of Innovation. This stream of the Clinical Innovation Program supports clinical innovation in the NSW health system, with a focus on accelerating implementation of ACI Models of Care/Frameworks. The project is submitted through ACI ’s Clinical Networks, Institutes and Taskforces for the potential to accelerate implementation. Across NSW, clinicians, managers, consumers and carers are designing and delivering new, efficient and effective ways to deliver services, achieving positive change for consumers, carers, communities and clinicians. The ACI Clinical Innovation Program outlines new models of care that have been developed by teams of local healthcare providers in NSW ; clinical innovators who identified a need for change and addressed the need by designing and implementing new models of care. These models are not clinical practice guidelines, but instead models based on “real life” examples of local practices, developed and implemented to improve experiences and outcomes for consumers and communities. These models of care are available to providers across the state to read, consider, and identify local opportunities for change for and improvement. Prioritisation: Local innovations are identified and assessed for state-wide applicability, these innovations are sourced and prioritised based upon sustainability and relevance to emerging trends within the health field. Assessment: Once the identified innovation (now known as model) has been prioritised, it is evaluated by ACI to formally review the benefits of the model and confirm sustainability for the model in the future. Network Alignment: The appropriate ACI Clinical Network reviews the model to ensure that it is contemporary and evidence based. The ACI Clinical Network will also advise if there are comparable models existing at other health facilities. Environmental Scan: Comparable models across NSW Health that were identified by the appropriate ACI Clinical Network, are assessed for similarities and additional innovations are mapped and reviewed for metropolitan, rural and regional suitability. Document Innovation: Once the previous steps are complete, the concept is ready to be drafted into a model for implementation. It is circulated to industry professionals, ACI Clinical Network Co-chairs and other key stakeholders for comment and once endorsed, is considered ready for implementation. Implementation: Implementation of the model will be supported by ACI through an EOI process. Once selected, the ACI will work closely to support multiple Local Health Districts to implement each model developed as part of the Clinical Innovation Program. Specialist Geriatric Outreach to residential aged care facilities ( RACF ) aims to maintain the health and independence of older people living in residential care. Specialist geriatric outreach services provide rapid access to medical and nursing care for older people experiencing rapid decline, in the RACF . This is an effective strategy for keeping older people well in their homes, reducing avoidable hospital presentations and/or admissions, supporting the older person’s choice for treatment in his/her home and reducing healthcare costs. 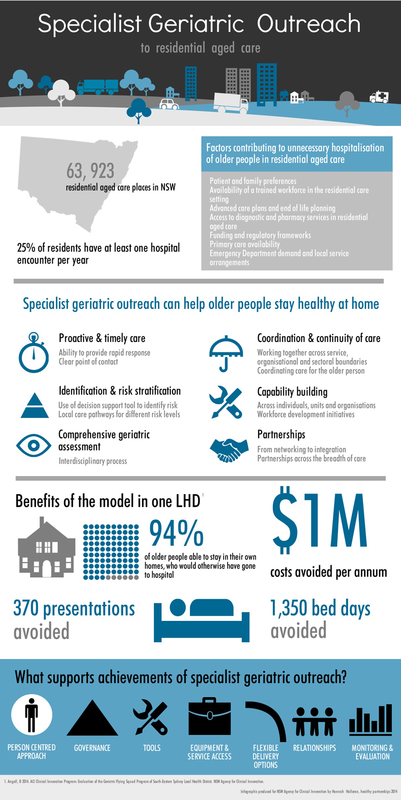 View the NBN News report on the Specialist Geriatric Outreach project. The Implementation Guide has been developed to support the translation of a model into an effective and sustainable new way of working. It aims to guide the reader in a step-wise fashion, through the three phases of Implementation and the various steps involved.